Sure, the folks at Firestone Walker – situated in California’s lush central California wine region – are riding pretty high – after winning the Champion Mid-Sized Brewery at the 2012 World Beer Cup, they grabbed two golds, and bronze at the 2012 Great American Beer Festival. So who can blame them? 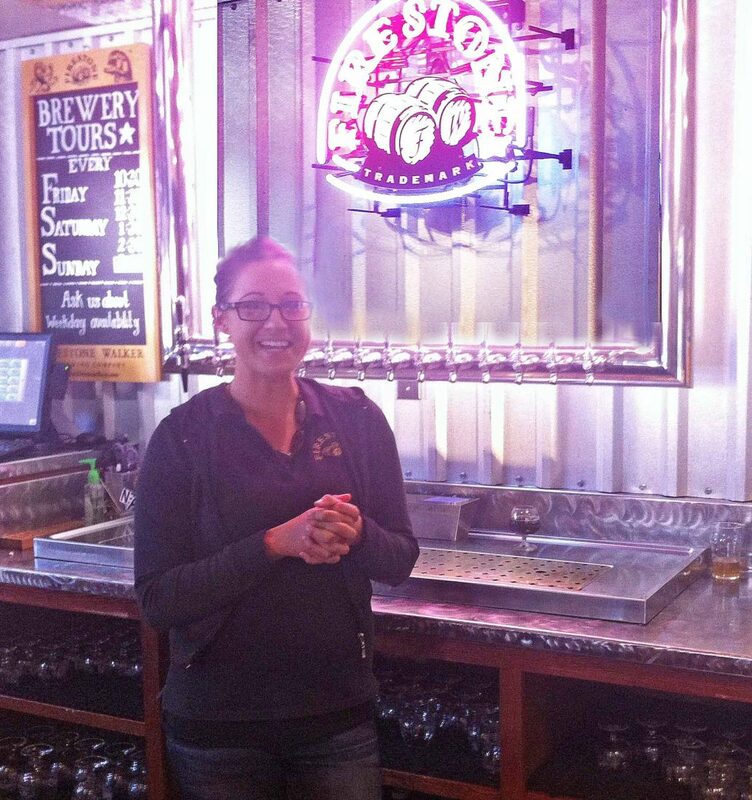 Started in 1998 as a project between brother in laws (Firestone of California and Walker of Great Britain), their brewery has grown into one of the hottest breweries in the US. Fun trivia fact: the Bear represents California (Adam Firestone) and the Lion England (David Walker) on their logo. Their award winning ultra-hoppy Imperial IPA “Double Jack” turned on my jets about a year ago when I found it, and then after I happened on their “Black Rye IPA” Wookey Jack (gold medal) in San Francisco, I knew they were something special indeed. Add their flagship DBA (Gold as well) and you just have the tip of the iceberg of their exciting beer portfolio. It was a hike from San Francisco – about 3 hours south down 101 – which quickly turns from urban to long stretches of artichokes, pepper and spinach fields. Just before San Luis Obispo the new brewery (bought from the defunct SLO Brewing Co) and expansive restaurant sits next to the highway. But I was rewarded for long drive at the first class tasting room offering 16 different beers – some available only there. 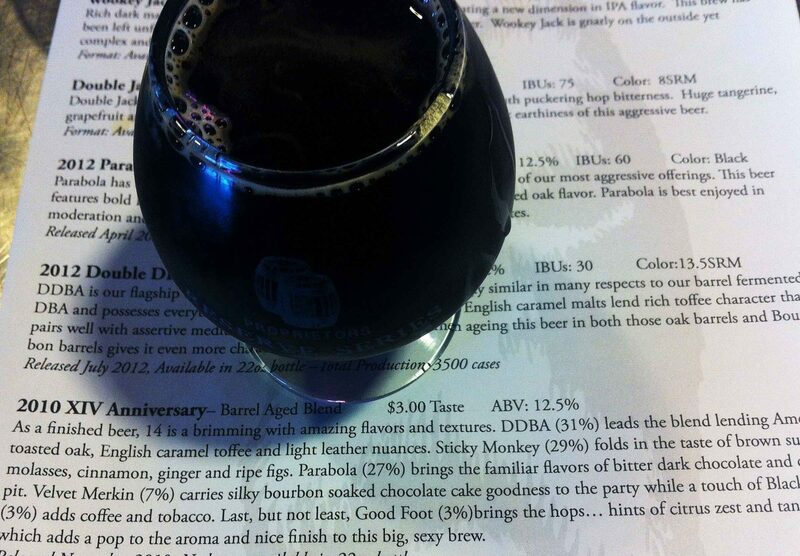 Unfiltered barrel aged DBA? Sure. Barrel aged Russian Imperial Stout? Of course. 2010 XIV Anniversary blend of five of their high gravity ales clocking in at 12.5% Abv? Bring it on. Self control tested – oh yes. The brewery wasn’t the only valuable acquisition from SLO brewing, Matt the brewmaster came from there as well. The story is that he was sneaking in to the padlocked bankrupt brewery to keep his brews from spoiling – a level of dedication (obsession?) that left the new owners impressed. After a very nice brewery tour with Shannon, I found the need for some sustenance before heading on. The next door the restaurant exceeded my expectations, with some unusual but hearty fare – along with the staples like gourmet pizza. You know the little train that runs around the ceiling at Ruby’s diners? 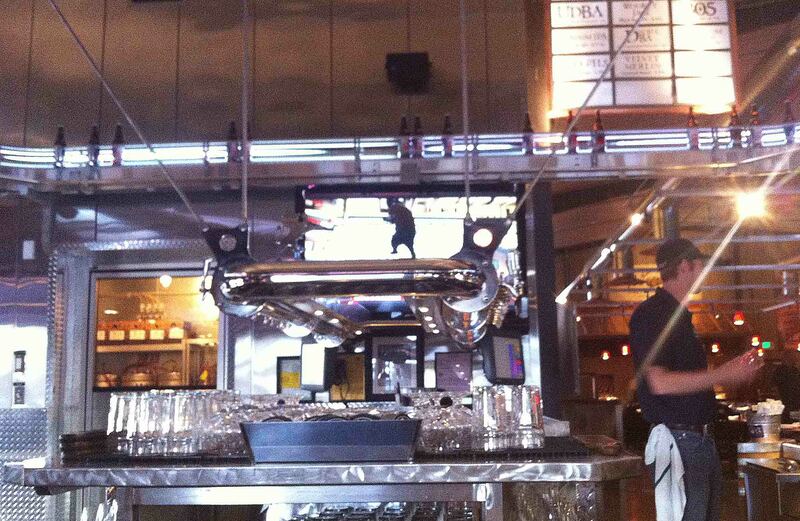 At the F-W eatery bottles of Firestone Walker rotate over the bar. Having not even reached their brewing capacity yet, more great Firestone Walker is coming our way – to the delight of beer appreciators everywhere.